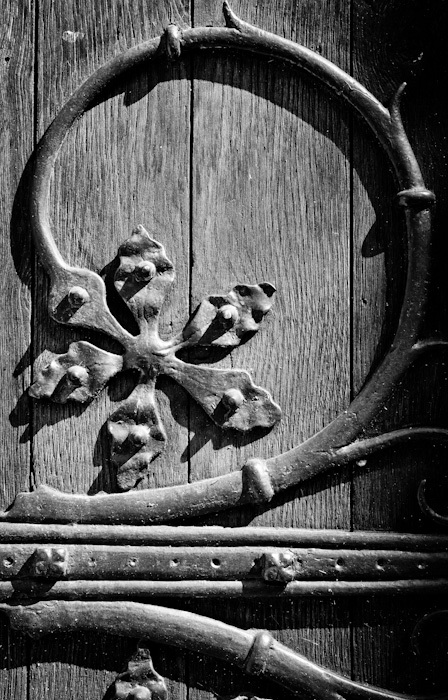 This photograph is a detail from a church door in Hampshire. I should say, from a 'techy' perspective, that the white dots in the photograph are not 'noise'; they are fragments of grit and dust caught in cobwebs and in the grain of the wood. Churches are at once ubiquitous in our landscape and increasingly marginalised in our secular society. Nevertheless, many of us still hold them dear as something that, poking above the skylines of towns and cities, denotes a connection to a reassuring past. On approaching any English village, it is likely that the church spire is the first thing you will see, and you may experience that warm feeling that the version of England established in our minds by poetry, paintings and propaganda has trained us to expect. Thus, we have an ambiguous connection to these things: most of us no longer worship, but we enjoy the connection to the past that forms our sense of self. Getting close to churches, as I have here in this photograph, discloses also an attention to detail in architecture and design that no longer exists. A neglected such building in a grubby corner of inner city will reveal, on close inspection, thoughtful design and careful craftsmanship in every detail, inside and out. It is not inconceivable that people in the future will marvel, in museums, at what we take for granted on our streets. Looking at this closely, one could not say whether this is a city church or one from a tiny, picturesque village. Indeed, it may have been built in a village that has since been swept up into a city during its growth. I think I will leave it that way, and just say this is in ‘Hampshire’, which may refer to any of many gorgeous little villages, or to hefty cities such as Southampton and Portsmouth. The fact that the ambiguity exists is a healthy thing, as it tells us that equal beauty may exist where one would and would not expect to find it. A detail from a door in Hampshire. Architectural Photography.